The Aggie ID card is the official New Mexico State University identification card that provides access to everyday life at NMSU. All faculty, staff and students are required to have an Aggie ID card. Your Aggie ID card must be presented to departments and/or personnel to verify eligibility and to access campus facilities, services and privileges. While on campus, you should carry it with you at all times. Only the person to whom it is issued may use the Aggie ID card. To receive your Aggie ID card, you can either submit a photo online or you may stop by our office and have your photo taken. You will need to provide an official government issued identification card to verify your identity before we can release your Aggie ID card. It is important to carry your Aggie ID card securely, just as you would a credit or bankcard. Keep your card clean and safe. Avoid bending your card or scratching the card’s magnetic stripe. Do not punch holes, add stickers or otherwise alter your Aggie ID card. Do not let your Aggie ID card make direct contact with magnetic stripes of other cards or anything else such as cell phones, laptop batteries, etc. as this may demagnetize the magnetic stripe on your card. Access Aggie Print funds. Students receive $10 at start of fall & spring semesters and another $10 within four days of Close of Official Withdraw Period. Students receive $10 total for summer semester. Access Aggie Print funds. Students receive $10 per fall & spring semesters and $5 for summer semester. To access various discounts & Crimson Cab, a separate Pete’s Pass is required. ASNMSU provides these specialty cards at the ID Card Services Office. 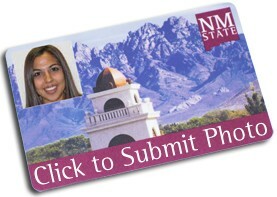 U-Passes, which allow access to the Las Cruces RoadRUNNER transit system are available at the NMSU Parking Dept. located at 1400 E. University Ave. between Barnes & Noble at Panda Express.